85 tears ago today, Nicola Sacco and Bartolomeo Vanzetti were executed in the electric chair at Charlestown State Prison. The following excerpt from my book Dedham:Historic and Heroic Tales from Shiretown gives a good summary for those who are not familiar with the case, and features some interesting and little-known facts for those who are. With the exception of Jason Fairbanks’s brief journey to the shores of Lake Champlain after his escape attempt, the affair was strictly a local one: Jason’s crime, trial, imprisonment, execution and burial all happened within a few miles of his birthplace. The county’s most well-known trial and one of the most controversial criminal cases of the twentieth century, on the other hand, featured international players and a worldwide audience. The defendants, Nicola Sacco and Bartolomeo Vanzetti, were immigrants from Italy. The defense attorney was from California. The judge lived in Worcester. Supporters of the defendants ranged from poor immigrants in working-class cities across the globe to wealthy and prominent writers, poets and celebrities. Sacco and Vanzetti were self-professed anarchists who were arrested in May 1920 for the murder of two South Braintree shoe company employees during the robbery of the company’s payroll. 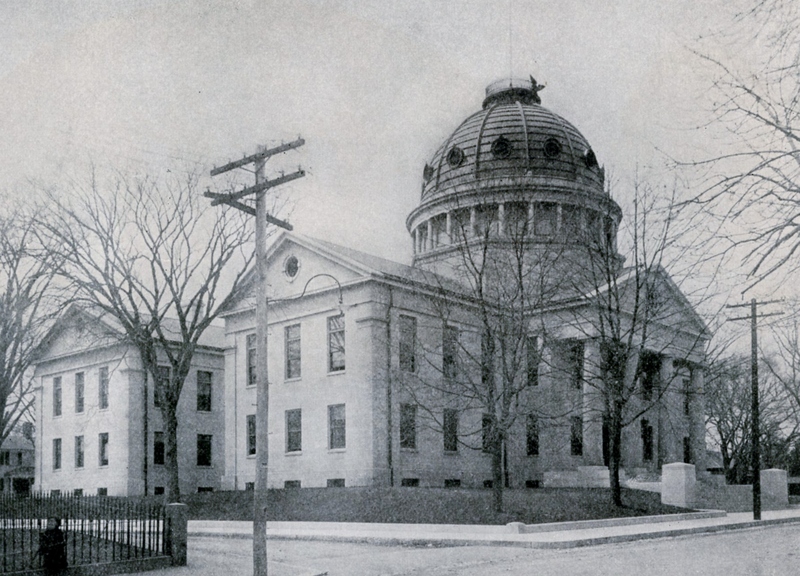 After a six-week trial in the Norfolk Superior Court in the summer of 1921, the men were found guilty and sentenced to death. Those in agreement with the verdict cite ballistics evidence, eyewitness testimony, the behavior of the defendants at the time of their arrest (both men were carrying weapons and lied to police about their recent activities) and the lack of credibility of the alibi witnesses. Critics of the verdict contend that anti-immigrant bias led to a conviction based on the defendants’ nationality and political views. The comments made by trial judge Webster Thayer outside the courtroom where seen as especially prejudiced. Worldwide demonstrations and protests supporting the men and decrying the legal process followed the convictions and intensified as their execution date approached. After an appeals process that lasted for five years, Sacco and Vanzetti went to the electric chair in the state prison at Charlestown on August 23, 1927. The case remains as controversial today as it was over eighty years ago, with historians and legal experts still debating the evidence, the behavior of the judge and jury, and the verdict. Dozens of books have been written on the topic, some concluding that the verdict was correct, others that neither of the men was guilty and still others that only one of the pair was guilty. While the protestors could not save the lives of Sacco and Vanzetti, their efforts did bring about important changes in Massachusetts legal procedure. Legislation was passed that gave the Supreme Judicial Court more power to review cases and reverse death sentences. Other procedural changes allowed judges a wider range of questions to use in determining the potential prejudices of a juror. Governor Michael Dukakis observed the fiftieth anniversary of the executions by issuing a proclamation declaring a Sacco and Vanzetti Memorial Day. While the governor’s remarks acknowledged that prejudice during the trial had failed the men, he neither pardoned them nor declared their innocence. *Although the names Sacco and Vanzetti are forever linked in history, they spent much of the seven years following their arrests in separate jails.Vanzetti had been tried and convicted of attempted robbery in Bridgewater in 1920, and was sentenced to seven years in the state prison in Charlestown, where he was held until his 1927 execution, with the exception of his stay at the Dedham Jail during the trial, sentencing and appeals. Sacco spent the entirety of his time in Dedham, save for a short trip to Bridgewater for observation after a hunger strike and two weeks in the Death House in Charlestown prior to his execution. *Residents living near the jail sometimes saw Sacco’s seven-year-old son Dante standing on the sidewalk outside the jail grounds, playing a game of catch with his father, who was exercising in the prison yard behind the wall. *The all-male jury (women were not allowed to serve on juries in Massachusetts until 1950) was sequestered for the six-week trial in the courthouse. They slept on cots in the grand jury room and bathed in the basement of the same jail where Sacco and Vanzetti were being held. On the Fourth of July 1921, the members of the jury were taken on an outing to the Scituate shore, where they enjoyed a lobster dinner. *Part of the testimony in the trial was given outside, on Norfolk Street behind the courthouse. The alleged getaway car had been parked there, and jurors, attorneys and witnesses gathered on the street and sidewalk to view the auto and listen to testimony. *Mrs. Sacco stayed at the home of Supreme Court justice Louis D. Brandeis on Village Avenue for a time during her husband’s imprisonment, as a guest of Mrs. Brandeis. *Over 600 men were questioned as potential jurors before a full panel could be seated. The most common reason for being excused from the jury was opposition to the death penalty. One sugar dealer attempted to get out of duty by feigning deafness, and was caught after he casually answered the judge’s questions, sending Sacco and Vanzetti into fits of laughter.After five hundred interviews yielded only seven jurors, Norfolk County deputies scoured the area, finding potential jurors at club meetings, band concerts, and on the job. One juror from Quincy was taken from his wedding dinner and forced to postpone his honeymoon until the trial was over. *A cap found at the crime scene was claimed by the prosecution to be Sacco’s. In a scene similar to that of the famous ill-fitting gloves in the 1995 trial of O.J. Simpson, defense lawyers had Sacco try to put the cap on, with comic results, as the ill-fitting cap rested on top of his head like a child’s party hat. *A convicted murderer jailed alongside Sacco in Dedham confessed to the murders in November 1925. While awaiting a retrial in a separate murder case, Celestino Medeiros slipped a note into Sacco’s cell alleging his own involvement with a group of Italians in the South Braintree robbery and murder and declaring Sacco and Vanzetti innocent. Trial judge Webster Thayer dismissed the confession as a poorly crafted fabrication told by “a robber, a liar, a rum-runner,” among other things. 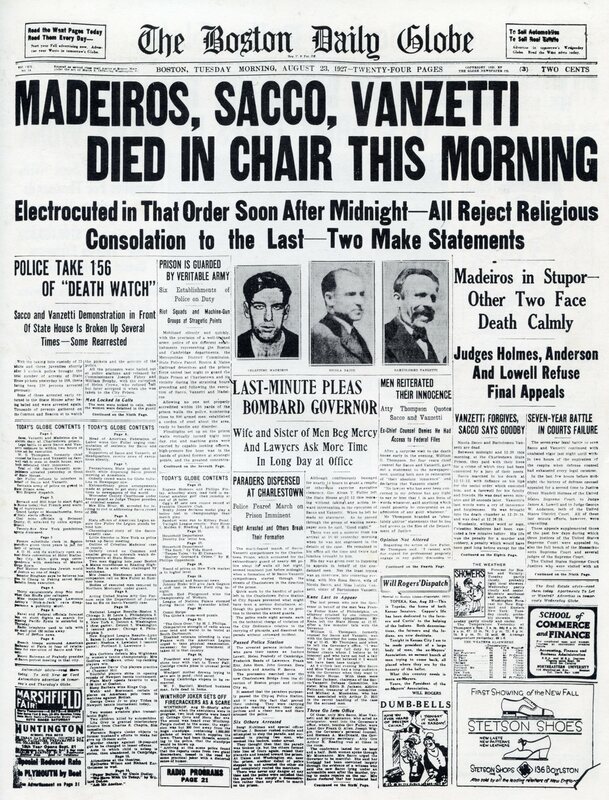 Medeiros was found guilty in his retrial and was executed at Charlestown just minutes before Sacco and Vanzetti. *During the trial, Sacco and Vanzetti sat in a wrought-iron “cage” used for defendants in capital cases throughout the commonwealth. The structure was more like a fancy Ferris wheel car than an actual cage, with tall sides and an open top and front. The cages were removed from all Massachusetts courthouses in 1960 as part of a civil rights initiative by state attorney general Edward McCormack. The cage was also used in the 1934 trial of bank robbers Murton and Irving Millen and Abraham Faber. The Supreme Judicial Court of Massachusetts has an excellent exhibit on the Sacco & Vanzetti case at The John Adams Courthouse, One Pemberton Square, Boston. You can also view the very informative “virtual exhibit” at their website by clicking on the link to the right. This entry was posted on August 23, 2012 at 4:27 am and is filed under History/Mystery. You can subscribe via RSS 2.0 feed to this post's comments. You can comment below, or link to this permanent URL from your own site.